Beadles Glass: Designer Gallery Featured Artist - Alicia Dabney of "Elements and Artifacts"
Designer Gallery Featured Artist - Alicia Dabney of "Elements and Artifacts"
Alicia is the newest Designer to be added to our Gallery. "Elements and Artifacts" is the name of her business. She has a very ethereal and organic feel to her designs and uses ancient histories, myths, legends, etc., to create fascinating art in the forms of jewelry, graphics, photography, among others. 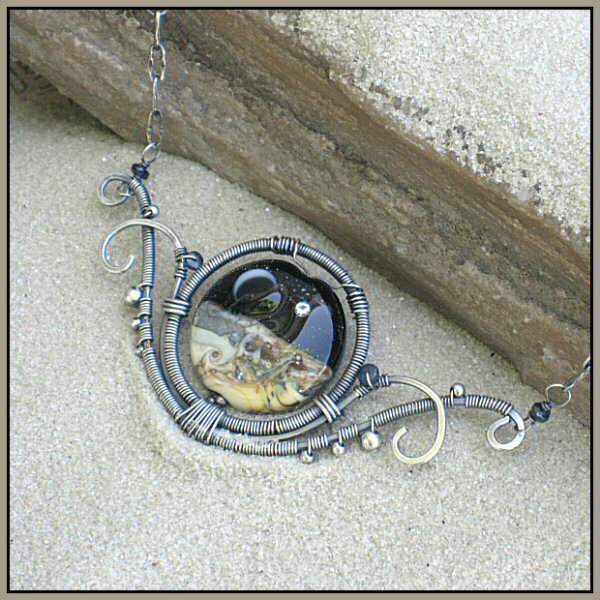 This necklace is called "Europa" and utilizes the Winnecke moon focal. I love the way she has positioned the focal in a wire wrapped frame which acts like a "flourished" platform to gracefully hold the bead. 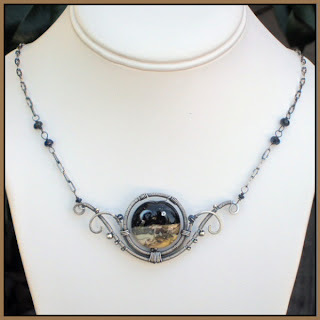 There are silver spheres and black songea sapphires utilized to reflect and sparkle. She has center hammered the chain links for that extra special touch of detail. The necklace itself measures 18". Thank you very much for sharing your beautiful creation, Alicia!